The fifth and final character Trailer For Indie slasher "Lake Runs Red" has been released. 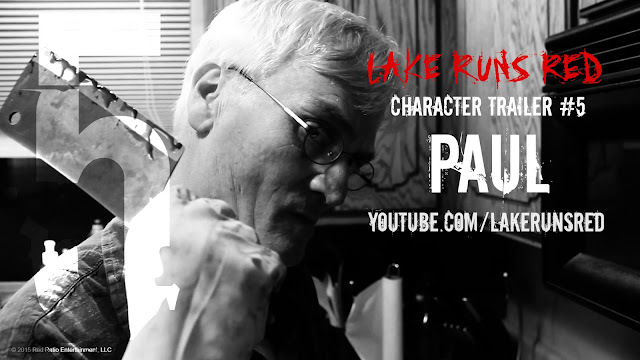 This final character trailer, focuses on “Paul” the most mysterious and secretive character in the film. Paul has an uncomfortably close relationship with his daughter Lauren and an unconventional infatuation with her best friend Melissa (Lauren Morris). After years of an unhealthy marriage to his cold, unwelcoming wife Gwen, he yearns for a fresh start, away from the lonely seclusion of northern Minnesota. Paul is expertly played by Michael Hertenstein, a veteran theater and film actor, who most recently performed in a high profile production of “To Kill A Mockingbird” at the world famous GUTHRIE THEATRE in downtown Minneapolis, this past autumn. Directed by Jason Riesgraf, written by J. Dan Moores & Jason Riesgraf, and produced by Jason Riesgraf, Jeff Fuller, J. Dan Moores, and Stephanie Riesgraf. “Lake Runs Red” stars Lauren Morris, Kaci Wegleitner, Michael Hertenstein, Helene Donohue, and C.J. DeVaan. Two college girlfriends go to their parent's secluded northern Minnesota lake cabin to prepare for final exams. An uninvited visitor stops by. He isn't there to study.